As banks reach for more yield, they are starting to lend to each other longer term. In fact banks are trying to lock in term rates that are still significantly higher than the overnight rate. We’ve come a long way from interbank lending being limited to overnight only. In the Fall of 08, term LIBOR was merely a quote – nobody was actually lending term. As the Fed floods the system with cash, the Fed Funds effective rate has dipped below 16 bp. Banks are placing term funds and borrowing overnight, which is a fairly profitable trade with low risk. Usually the risk with these trades is that the Fed suddenly raises rates, making overnight financing more expensive than term. There is little likelihood of such an event these days, and with the overnight rate staying under 25 bp, the 1-3 months term trade will generate 25-35 bp. The Fed wants it that way to improve interbank lending, reduce reliance on TAF, and boost bank profitability. 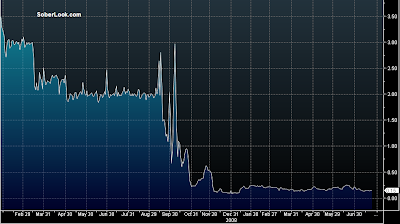 This willingness to lend longer term has brought 3-month LIBOR below 50 bp, which is a record low. The one and three months LIBOR rates have converged, flattening the short-term yield curve. 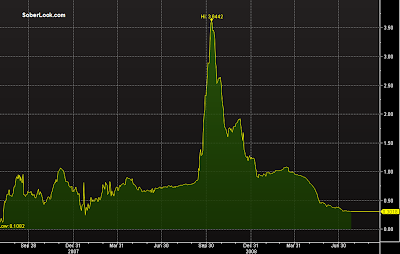 The 3 months LIBOR-OIS (overnight index swap) spread has dropped below summer 2007 levels. 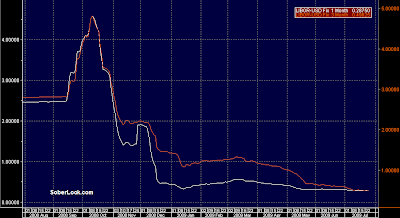 This spread compares actual LIBOR to the level LIBOR would be based on projected overnight rate. The higher the spread, the higher the perceived credit/financing risk. Money markets have reached a level of stability not seen for some time, which is critical in order to keep the credit markets open.